A grass-like herb of the onion family. Flat tube-like tops which are cut as needed have a mild flavor midway between garlic and onion. 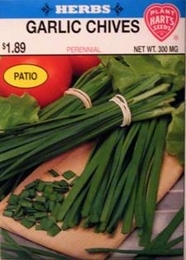 Used for flavoring salads, soups, stews and stir-fry. When plants are 5-10 inches tall, cut outer leaves near ground with scissors. Use fresh or frozen. When in bloom, the flowers are of a glorious white and are very decorative in a border. Thinning - when plants are 2-3 inches tall thin to 4 inches apart.